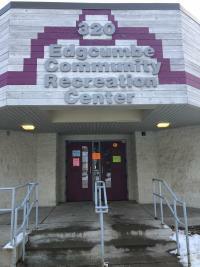 Edgcumbe Recreation Center offers educational programs, after school activities, open gym, family events, fitness center memberships, youth and adult athletics, outdoor skating, field rentals, rental space for parties, meetings, and events, and much more. Click the activity numbers to register for Edgcumbe Recreation Center activities online, or call (651) 695-3711. For all citywide programing, view the seasonal Parks & Recreation Activity Brochure. For field reservations or to reserve space at this facility, call (651) 695-3711. Edgcumbe Recreation for Preschoolers is a program for children ages 3 - 5 years, held at Edgcumbe Recreation Center. Our emphasis is placed on providing a warm and nurturing environment along with giving emotional support and encouragement. To register or learn more contact Katie at 651.695.3734 or Katie.Hemsworth@ci.stpaul.mn.us. Subscribe to Edgcumbe Recreation Center email updates. Follow Edgcumbe Recreation Center on Facebook.